The Trimble WM-Drain farm drainage solution is a concept-to-completion toolset that streamlines the survey, analysis, design, installation, and mapping steps of surface and subsurface drainage. The WM-Drain solution ensures optimal 3D drain placement, which improves crop yields by controlling ponding, optimizing root depth, maximizing planting seasons, and minimizing nutrient loss. Survey: Collect 3D field data with ease using either the WM-Topo™ survey system or XCN-2050™ display. 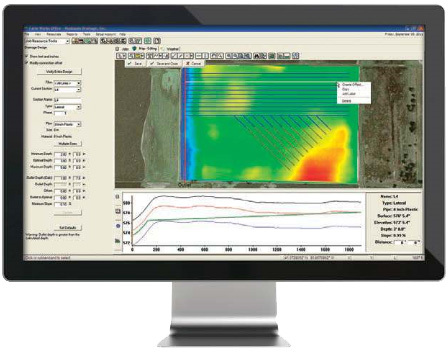 Analyze: Analyze the 3D field data using Farm Works™ Surface software to make better-informed drainage decisions and plans. Design: Design and verify a complete 3D drainage system using Surface software, or design drainage lines on-the-go without having to leave your vehicle. Install: Take your drainage designs back to the field and utilize the WM-Drain module on the XCN-2050 display along with 3D machine control technology for precise installation of your pipe or surface ditches. Map: Map the true location of your installed drainage pipes or ditches and utilize the records for future maintenance or drainage expansion projects. Complete all your drainage operations with one integrated solution that can be used with any type of drainage plow. Improve crop yields up to 30% by removing excess water reducing plant stress and allowing for a more developed root zone. Reduce field compaction and minimize soil erosion. Increase operating efficiency up to 20% compared to laser equipment. PLM Water Control is a component of PLM Software that provides surface and subsurface water management solutions. For more information about the Trimble WM-Drain Farm Drainage Solution, call our Ag Technologies location (1268 E 100 S Rochester, IN 46975) at 574-223-2714.